Stan and Joe – short story | brainsnorts inc. The point of view is going to dance around a little bit. I’m okay with that – this time. Also, I’m not sure if the setting comes through well enough. It’ll be one of the questions at the end. I won’t answer the questions because I don’t know if that’s spoiler-ish. I know some people like to read the questions first, which is not a good idea, but I’ll wait for comments and then let you know what’s right. Long one, about 5,600 words. It was late in the day, nearly sunset, when a man in a faded, gray suit stumbled out of a store on dusty street in the town of Heart. Shortly after the door slammed shut, it opened again as the owner of Goddard’s Pawn Shop stared at the man on the sidewalk. The store owner, though noticeably older and shorter than the man glaring back at him, chased him out rather easily despite the size and age difference. “Let me make this clear,” said Goddard, pointing a finger towards the other man’s face. “You were wanted here yesterday. You are not wanted here today. You will not be wanted here tomorrow or ever. Not you. Not your kind.” The older man tightened his fists, then relaxed. “Please. Go back to where you belong.” The older man turned and re-entered the air-conditioned store, leaving the man in the gray suit tugging at his lapels and collar while attempting to regain a semblance of dignity. The suit, which matched his thick, gray hair, was as worn out as once-black shoes. “You haven’t seen the last of me,” he called. The door had closed, but his voice echoed through the glass. He watched Mr. Goddard’s walk pause for a moment while walking to his place at the cash register. The sun was setting at just the right time to ignite the street from one end to the other, making the man in the gray suit appear as if he were walking straight out of a fire. He checked the buttons of his jacket, straightened his lapels, and was ready to take a step along the sun-baked street. From the moment the pawn shop door had opened, he had been aware of a man whose eyes had locked upon him. “Young man, is there something I can help you with?” The other man, leaning on one of the few trees on Main Street, said nothing. His lower lip quivered and his eyes averted from the sunset glancing off the older man’s shoulders. “No, sir,” said the younger man. “J-Joe.” As Joe looked ahead, he could see their shadows stretching over a dozen yards ahead. The sun, almost gone behind them, cast an orange glow upon the buildings up the street before them. They approached a corner where a boy ruffled through a trash can looking for anything he could either eat or sell. A car approached from the side. Joe was ready to stop, but Stan continued and forced the car to sudden halt. “Yes, I did.” Joe noticed that they had walked much further and faster than he would have guessed, and they were approaching the edge of town. The houses were fewer and the trees taller and thicker. Ahead was a dirt road that wound into the darkness. Joe looked again at the Stan as night was nearly upon them. Stan’s suit seemed much cleaner and nicer than it had before, even with barely enough light to read a newspaper. Joe’s head grew a little heavy, but he walked on as if a father he hadn’t seen in ten years had come to guide him somewhere. Joe’s steps hesitated for a moment but he continued on, just as Goddard had when Stan had warned him that he would be back again. Only a few minutes later they came upon a clearing twenty feet across. In the center was a ring of stones about the size of bowling balls and half a dozen tree stumps around as if they had been placed like seats for a meeting in the woods. “Will do,” said Joe, and he was off with more energy than the he had all day prior. When he returned a few minutes later with a hefty branch longer than his own six-foot height, Stan had already begun a small fire. “Wonderful,” said Stan, rising from one of the tree stumps, “now if you wouldn’t mind breaking that up into smaller pieces, I’ll go get us some dinner.” Before Joe had a chance to ask, Stan disappeared beyond the ring of trees just faintly lit by the beginnings of the fire. Only a few minutes later, Stan returned to find the large, hefty limb broken into many smaller chunks. “Well,” Joe was still catching his breath, “I put the limb on one of the tree stumps, and I stomped on it one piece at a time. What do you have there?” He pointed to a handful of something in each of Stan’s fists. “Dinner,” said Stan, and he lifted his arms to show two lifeless rabbits. Stan pulled another knife from the sack, handed it to Joe, and showed him the proper way to skin an animal. Roughly two hours later, two men with satisfied stomachs leaned against adjacent trees and picked at their teeth with sharpened sticks. “There’s a few things I don’t understand,” said Joe. “I’ll do my best to help you,” Stan smiled. “This old thing?” Stan laughed, then he stood and removed his jacket. He held it up for Joe to see and smacked it with his broad hand. Dust flew in all directions, and frayed cuffs and seams showed themselves to Joe, though he couldn’t recall seeing such wear earlier in the day. Each man rolled himself up in a blanket, wriggled a little closer to the fire, and needed only minutes to fall asleep. 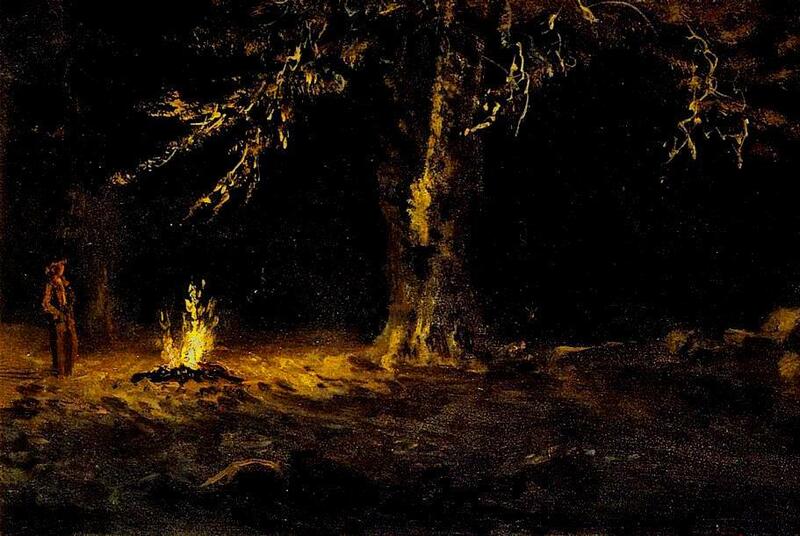 In the last moments of Joe’s dream, he imagined the woods in which he had been sleeping were on fire. Branches were falling and leaves crackled as they burned. He sat up quickly and noticeably sweaty compared to the cool morning. “And,” Stan continued, “let’s just say that farm has some very healthy cows too.” From behind his back, the man in the gray suit produced a bottle of milk. “We do? Where?” asked Joe. “Trash picking?” said Joe. “Never thought I’d ever sink that low.” He stopped eating. “Didn’t I say to call me Stan?” said the older man as he kicked dirt on the campfire. “Yes,” said the younger man as he did little more than sit, watch, and feel rather helpless. Later in the day, about an hour before sunset, Stan and Joe had created quite an appetite for themselves. They had spent the bulk of the day strolling up and down the various streets of town poking through trash cans at the curb in front of most houses on the southern side of town. Each man had a burlap sack in which they’d stash anything that seemed as if it might be worth something. “I can see just fine,” said Joe. “Time to go.” Stan turned and headed back towards Main Street. Joe followed, but not without peeking at each trash can they passed. Joe wanted to keep searching, but he trusted Stan enough to quicken his pace. Just as the previous night, the two walked side by side as the sunset followed them out of town and into the woods for a campfire and wild rabbit for dinner. “Say, Joe,” said Stan, “let’s see what we collected today.” Like two kids pulling gifts from a stocking on Christmas morning, each man showed the other what he had found, random things including glass jars, worn clothing, kitchen utensils, tools, and more. Eventually, then sat back and, like the previous night, picked at their teeth with sharpened sticks. Branches thick with summer leaves and stars in the night sky watched from above as if they knew something was on the horizon. Stan reached into the sack and, with a look of surprise, slowly removed something with edges that reflected the fire light. “What is that?” asked Joe. “You would think so,” said Stan, “but it was an awful hot day. Sometimes things just slip by, you know? Sometimes we can’t give attention to everything. Sometimes, we just miss things. Right?” Stan watched as Joe slowly leaned back against the tree stump again. “Something got you down?” asked Stan. “Yeah, you might say that.” Joe’s eyes were growing misty, and it reflected fire light. Stan’s eyes popped and his mouth twisted. “Don’t say such things! That’s a serious call, Joe. Very serious. You must be hurting awful bad to say something like that.” Stan leaned forward from his stump, stood, and sat upon it. “No,” Joe mumbled, “never a gun. No.” He stared into the fire, allowing the flames to dance in his eyes. Those same flames seemed to reach up and brush against Stan’s face on the other side of the fire. The waves of heat climbed up from the fire, making Stan appear as if he were underwater. The young man’s eyes might not have blinked for half a minute as he stared back. His mind wavered between weightlessness and smothered. “I’d rather not say. I’d rather just have that gun.” Joe’s eyes moved from the older man’s eyes to the black, metal object in his hands. Stan held the gun up higher so it was in line with Joe’s face. “Let’s talk about this,” said Stan, almost pleading. Joe looked down into the fire and kept his eyes there as he began. I was just a regular guy with a regular job in the town general store. Mr. Parker, my boss, was a good man and took a liking to me. He helped me find a home. He hired me to do work around his house because he had a bad arm and couldn’t lift much. I would have dinner with his family sometimes. Went to his church too, and I met a great girl there. We got married and had two kids. Beautiful kids. Everything was great, and then hard times hit. First, people started losing their jobs. Farmers were killing their milk cows just to eat. The cow’s feed corn became the family’s dinner. Everyone in town was hurting, but the store was doing okay because people still needed things. Then things got worse. People needed things, but they couldn’t afford them. Mr. Parker, being such a nice man, let people open charge accounts. He kept records, people promised to pay him back, but he knew they might not. Still, he allowed it. Then, he had to make a choice to either let me go and put me on a charge account or keep me on without paying me. He decided to let me go because he said that a strong, young guy like me can find a job somewhere. If he kept me on without paying me, it would keep me from finding something else. I told him that I would be okay if I stayed on, but he felt wrong about it. I didn’t know how to tell my wife. It was too embarrassing, and I felt too worthless. I pretended I was going to work every day, but really I was just wandering around the county. I was going to abandoned houses, seeing what I could take that might be worth something. But it wasn’t stealing, not to me, because those folks had up and left their homes to find work somewhere else. When I would get home, I explained to my wife Mary that Mr. Parker couldn’t pay me with money but was paying me with things from the store. I didn’t have the heart to tell her the truth, but I knew one day I would have to explain. I kept putting it off. Then one of my kids got sick, but I had nothing to pay the doctor. He made her well, bless his heart because he knew I was stuck, but I told him I would pay him when I got paid the following week. Had to say that because my wife was right there. Doctor looked at me a little funny because he probably knew I wasn’t working for Mr. Parker anymore. But I could tell he knew to just let me talk in front of Mary and the kids. Good man, that doctor. The next day, I had an idea. During the day, instead of wandering, I went to Mr. Parker’s house to speak with his wife. I was planning to ask her if it was possible to convince her husband to let me do some more work around the house to pay the doctor. I could build a shed, fix a roof, and all kinds of things around the house. I was sure there was something I could do. I knocked on the door at about ten when I knew Mr. Parker would be at the store, but nobody answered. I thought it was odd, so I went around the back of the house and knocked there. I saw his car still in the yard, and I knew he never walked to the store. Nobody answered when I knocked out back, and I didn’t know what to do. I stood there and looked out at the pond behind his house. It was such a beautiful day, the ducks were swimming, and the sun was shining down on everything. Then I heard a noise inside the house. It sounded like a scraping, or maybe it was like someone was hitting something, like with a stick. I don’t remember, but I felt like I had to find out. I tried the back door. It was locked, but I pushed it open easily. Everything downstairs looked just fine, nothing looked wrong, so I went upstairs. In the first bedroom, I found something awful. His son, only about ten years old, was on his bed. His arms were at his side, he was blindfolded, and he had been shot in the head. In Mr. and Mrs. Parker’s bedroom, his wife was the same way in their bed. I went into the bathroom, and there was Mr. Parker. He was in the bathtub. Whiskey bottle was smashed on the floor. He had a mark on his head, and I think he tried to shoot himself but didn’t get it right. I guess he was either already drunk, or he then got drunk. His right hand was cut, so was his left wrist. The tub was full of blood. He must have shot his family and then killed himself. I don’t remember leaving the house, but the next thing I remember was being downtown in front of his store. People were knocking, looking in the windows, and wondering why he wasn’t open. I knew everyone there, everyone knew everyone in town anyway, and one of the people there was the bank loan manager. He saw me and waved me over away from everyone else. He asked me if I had seen Mr. Parker. I didn’t answer, didn’t want to say yes or no, just wanted to wait him out. I knew him because he had come to me privately about my bank loan. I had missed my last two payments, and most people knew that him looking for you was bad news. Then I went home. I saw my wife and told her that there was a problem at the store and I might be late tonight. I said that Mr. Parker had a lot of heavy deliveries and lifting to do, and that it might take long. I told her not to wait up for me. Then, when everyone had left hanging around the store, I went around back. I knew where an extra key was hidden, and I went inside. I kept the lights off and started filling a sack with as much as I could. Mostly canned foods, things that might keep me going for a while. I took some camping things, candles, matches, knife, sharpening stone, a few other small things. Then I said another prayer, for both me and my family. Prayed to God to forgive me for stealing. I locked up, and I just started walking. Joe lifted his eyes from the fire up to Stan. Stan shifted his weight back and then forward, leaning his elbows on his legs. Joe looked back up at Stan again. Joe watched as Stan stood, which made the younger man feel even smaller than he already felt. Stan moved around to the other side of the fire. He reached and put a hand on Joe’s shoulder. When he did, Joe felt something like a spark bite right through his coat. “I give you my word on that,” said Joe. “I’m going to sleep,” said Stan. Joe looked to his left to see the gun. The barrel was aimed away from him. It seemed as shiny as a brand new car in a parking lot. He wasn’t certain how long he had stared at the gun, but by the time he looked up again he saw Stan motionless, wrapped in his blanket with his back to the fire. Joe found two more chunks of wood and added them to the fire, making sure to keep the area warm for the next hour or two. Then he sat back down and stared at the fire again. Flames danced and teased him. The strips of orange, red, and yellow waved at him, taunted him, licked at him like teasing tongues of heat and hate. Hate for himself. After what seemed like only a few minutes, Joe blinked away the dryness in his eyes. He thought at first the wind might have kicked up and pushed some smoke in his face. But when he looked at the fire, he saw that the two small logs he had added were nothing but ashes. To the best he could think, he had been sitting in some kind of trance. He tried to stand, but his back and legs ached, convincing him that he must have been motionless for as long as it took those chunks of wood to burn down. He looked to is left again. The gun was still there. He looked again into the fire, what remained of it. He looked at Stan, motionless and still wrapped in a blanket. He looked again at the gun on the tree stump. A man in a faded, gray suit entered store on dusty street in town of Heart. Shortly after the door slammed shut, the man strolled up to the owner of Goddard’s Pawn Shop. The store owner folded his arms and narrowed his eyes. “State your business,” said the older, shorter man. Stan reached into his coat and removed a shiny, black gun and placed it carefully on the glass case that separated him from Goddard. Goddard looked down at the gun. He face grew gray. Stan turned on his heels and headed for the door. Goddard wobbled left and right as he followed Stan to the front of the store. “You haven’t seen the last of me,” he called. Then he turned and walked away. The sun was setting at just the right time to ignite the street from one end to the other, making the man in the gray suit appear as if he were walking straight into a fire. Did I make it clear who Stan and Goddard really are and what their relationship is? Did you get a sense of the setting? Although I tried to keep the language so that it would seem like the 1930’s, kind of a depression era thing, I also want the events to be versatile enough to be present day. Originally, Stan’s suit was very crisp, new, and shiny. Shoes too. Then I changed it. I might not have caught all of the changes. If not, sorry about that. If you have no idea what I mean by those two questions, then I did not write this well enough at all.